The fixed-income expert also warns of the effects a strong dollar has on equity markets and sees continued weakness in oil prices. 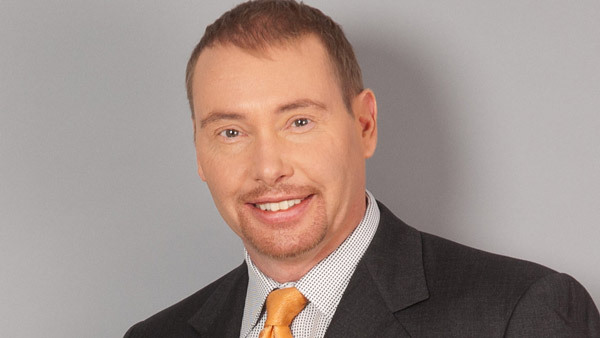 Jeffrey Gundlach says his flagship fund had a banner year in ’14. DoubleLine CEO Jeffrey Gundlach says the Federal Reserve has not learned from its other central bankers, and if it moves to raise interest rates mid-year it may regret it. “The Fed is intent on being a blockhead,” Gundlach said Tuesday on a conference call, describing the characters in the animated “Gumby and Pokey” show. Still, he acknowledged that the Fed may not raise rates if deflationary figures continue to dominate headlines. The fixed-income expert also is concerned about the continued emphasis on low interest rates around the globe. Low interest rates and central bank buying mean some $2 trillion of foreign bonds are producing negative yields. But Gundlach sees the U.S. 10-year yield dipping below 2% and then rebounding to 3%. “I do think inflation is not a problem” over the next year or two, he explained, though Gundlach said it could be a few years or so from now. But he also acknowledged the negative impacts that a strong U.S. currency can have. “It is seen as a risk for equities, and even U.S. equities don’t seem to like the U.S. dollar strengthening,” Gundlach explained. Though the precious metal is down in early-2015 thanks to the strong U.S. dollar, Gunlach is bullish on gold due to buying on the part of emerging-market central banks. He sees gold hitting $1,400 this year. Gundlach is not in the camp that sees crude dropping to $10-$12 a barrel, though it may fall below $43. By the end of the year, he predicts oil is moving higher than the current level, which is about $48. For long-term investors, he points to the value of owning Indian stocks. His view of investment-grade bonds is that they are overvalued, but he sees high-yield-grade bonds as fairly valued. The firm’s flagship fund, the DoubleLine Total Return (DLBTX) returned about 6% last year. Gundlach expects this year’s returns to be around 5%. “Yields will chop around this year,” he stated. When asked if his time and focus are spread too thin these days – DoubleLine recently launched a fixed-income ETF in partnership with State Street – he explained that the ETF is based on the firm’s core funds, and thus doesn’t require much extra effort on his part.